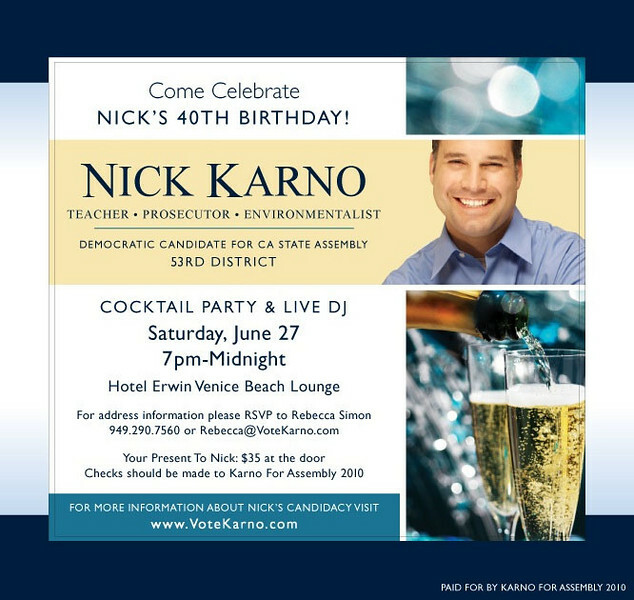 Nick Karno, Candidate for California State Assembly (District 53), celebrates his 40th Birthday with family and friends in Venice at the new Hotel Erwin. Nick is running for State Assembly to address the serious environmental issues our State faces, to restore our education system for future generations, to protect our public safety with adequate resources, and to create high-paying jobs by investing in sustainability and the green economy. Nick has been a teacher of bilingual education, is a dedicated environmental activist - having worked with Al Gore to address climate issues, and is currently a prosecutor working with the LA City Attorney's office. NEW TO VENICE. A message from Hotel Erwin. We look forward to welcoming you to the Hotel Erwin, a Joie de Vivre Hotel formerly the Marina Pacific Hotel & Suites for your upcoming reservation. The hotel is currently undergoing a re-invention The Hotel Erwin will immerse you in the whirling street carnival that is Venice Beach. A mere 200-feet from the sand and overlooking the famous boardwalk, you’ll be at the epicenter of creative rebellion, Southern California-style. In June we will be opening our new restaurant HASH, a comfortable “chill” dining room and patio. Hash will featuring fresh local market selections to highlight “from scratch” breakfast and dinners. Also opening this summer will be ROOF, our open-air rooftop lounge with amazing view of the beach and the surrounding communities featuring handcrafted cocktails and light snacks. We encourage you to book reservations for these locations in advance, our team at the hotel is happy to book those for you. Call us at 800-786-7789 to make reservations. We look forward to welcoming you to the Hotel Erwin as it transforms itself. RIGHT CLICK AND SAVE TO GET YOUR FREE PHOTO(S), COMPLIMENTS OF NICK KARNO AND HOTEL ERWIN.